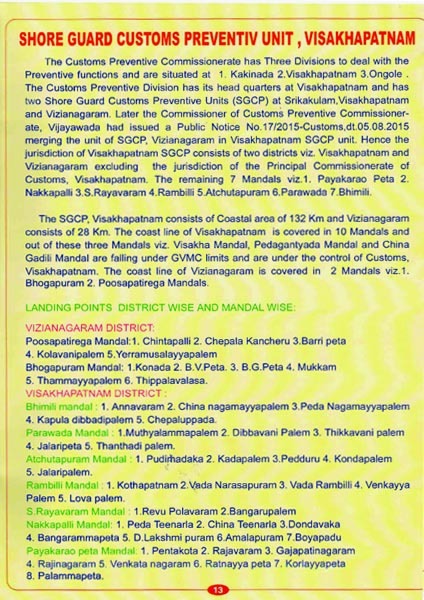 The Shore Guard Customs Preventive Unit was formed with effect from 15.10.2014 as per Public Notice No.0112014- Customs d1.18.11.2A14 issued by the Commissioners of Customs (Preventive) Commissionerate, V'ljayawada from C.No. Vllll48121l2014-Cus.Tech read with Notification No.78/2014-Cus(NT), dt.16.09.2014 of Government of India and Public Notice No.1l2}14General No.22014 dated 7.10.2014 of Chief Commissioner of Customs, Central Excise and Service, Vizag Zone. Krishnapatnam in Nellore district. This unit extends with Tmandals, this unit stretches from North to South 91kms approximately. 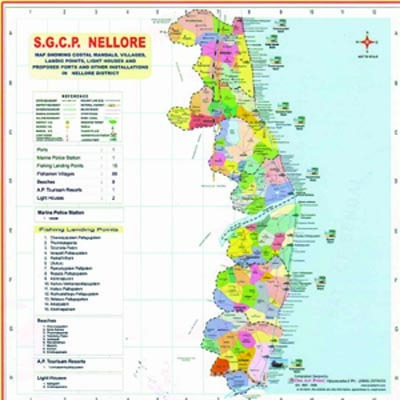 Similarly East- st jurisdiction extends up to 34kms beyond Nellore. 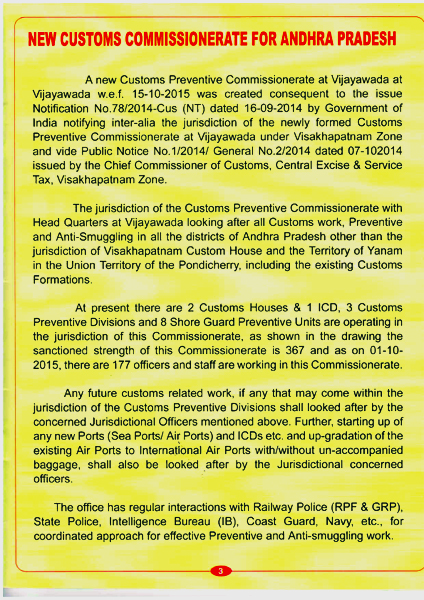 Further, the jurisdiction of this unit was changed vide public noti no.171201S-Customs, dated 05.08.2015 issued by Commissioner, CPC, Vijayawada from C.No.Vll/1 812341201S-Cus-Tech. 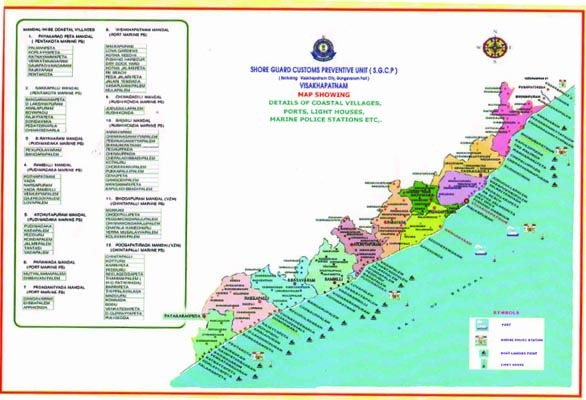 This covers, the coastal Tmandals of kavali, Bogolu, Vidavaluru, Allur, Indukurpet, T.P.Gudur, Muttukur and rresponding inland mandals of Nellore district and Cuddapah, Ananthapur Districts..
1. Krishnapatnam, 2.lsukapallipallepalem, 3.Nelaturupalem, 4.Thummalapenta. 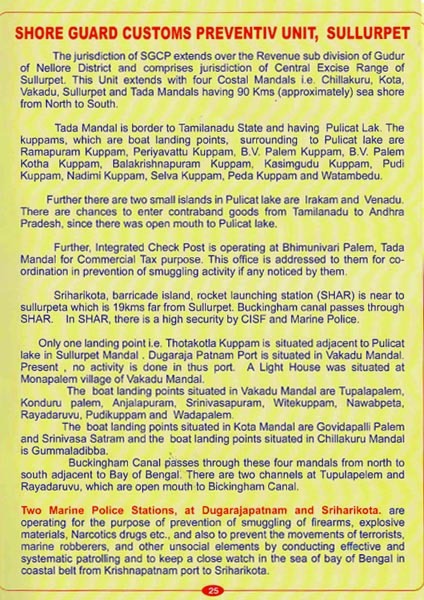 Marine Police station is situated at lskapalli. 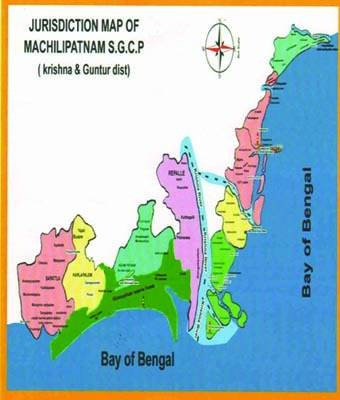 Chennayapalempattapupalem, Thummalapenta, tichetlapalem, Ramatheertham, Utukuru, lsakapalli, Ramudupalempallipalem, Mypadupattapupalem, Krishnapuram, Kodurupathapalem, Muthyalathopupattapupalem, A tpalem, Nelaturu. 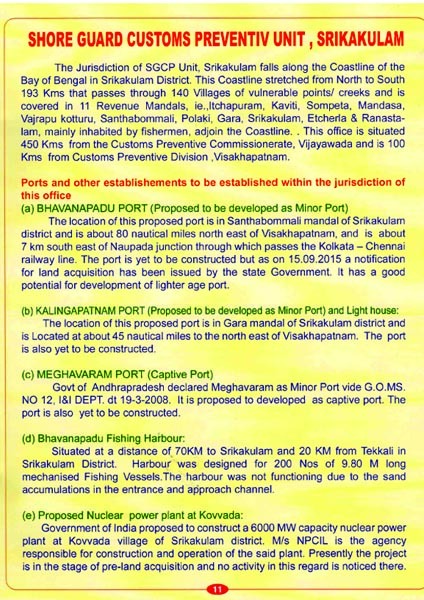 The following are the important canal routes in this jurisdiction Krishnapatnam to Epuru, Nelaturupalem, Pennanal. 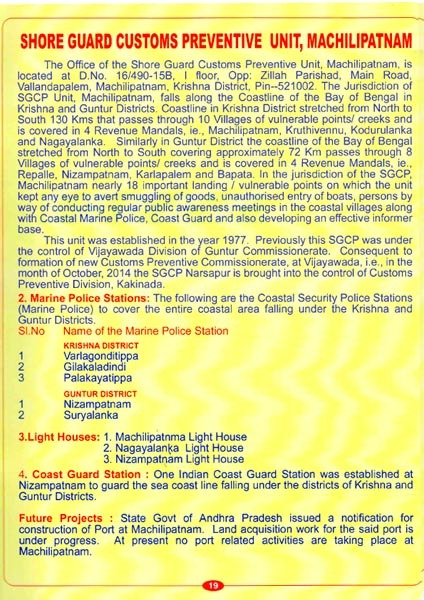 Surveillance Activity by SGCP; NELLORE: Visits are being made to the Light House Point (lskapallipallipalem), Marine Police station at ls palli and Krishnapatnam Out Post. Visits are also made to certain vulnerable points / Creeks li Nelaturupalem, Krishnapatnam and also places fike Tummalalpenta, Utukuru, Kudithipalem, Ramathirdam, Epuru. Contacts were being made with lo lfishermen, villagers, Local State Govt. Officials like M.R.OsA/ROA/AO ahd also local Poli Stations. 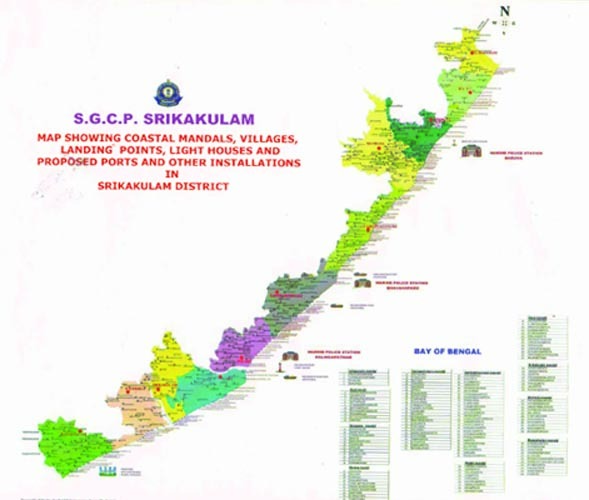 Two light houses one at lskapalli & other in Krishnapatnam are situated in this jurisdiction. 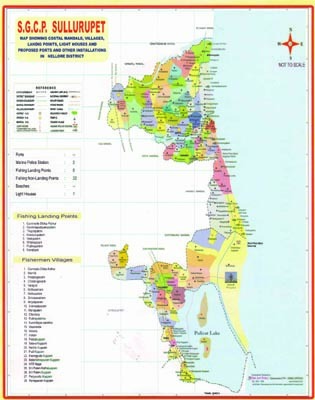 Chennayapalem, Thummalapenta, Lakshmipuram, Aadinarayanapuram, Thatichetlapalem, Aadinaneyapuram, lsukapallipattapupalem, Mypadu, Kollimittapalem, Koduru, Ramalingapuram, Konetimitta. 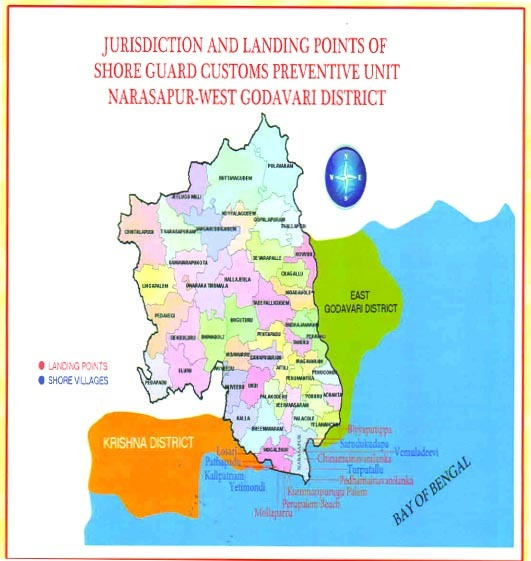 unit has been formed for customs preventive and anti-smuggling work including sea patrolling, coastal patrolling and shore surveillance in 12 coastal mandals of East Godavari District covering 85 coastal villages and the Yanam district under the Union Territory of Puducherry. 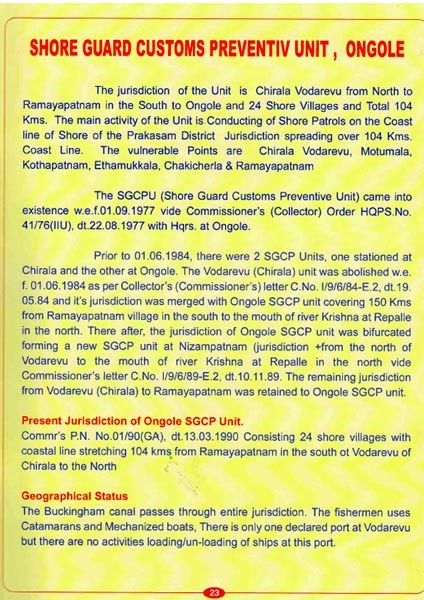 In the jurisdiction of the SGCP, Kakinada nearly 23 important landing / vulnerable points on which the unit is keeping eyes to avert any type of smuggling, unauthorised entry of boats, persons and goods by way of conducting regular public awareness meetings in the coastal villages along with Coastal Marine Police, Coast Guard, Forest Department and also developing an e ctive informer base. This unit registered two cases on illegal smuggling of scrap and waste oil through coastline. 3. Antharvedi Light House - F 0957 at Antharvedipalem. oil rigs. The above facility is exclusively used for handling of Crude Oil transportation. 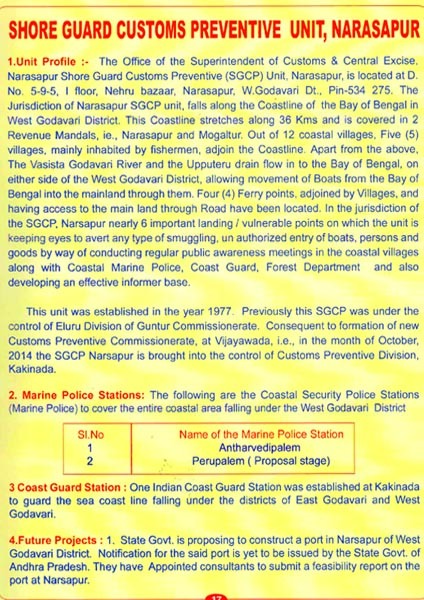 One lndian Coast Guard Station was established at Kakinada to guard the sea coast line falling under the di icts of East Godavari and West Godavari. 1. 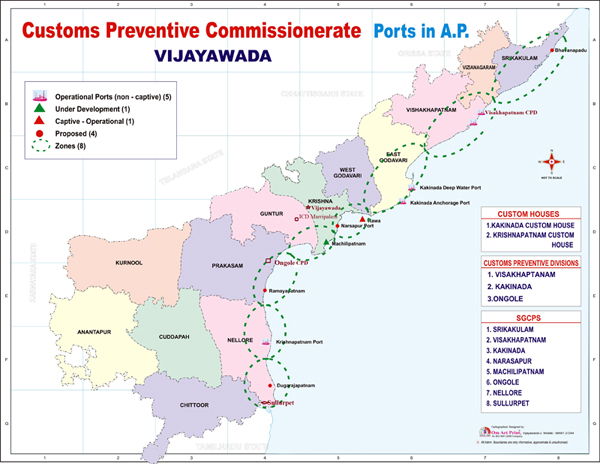 One Port in between Kakinada and Tuni.to cater the needs of the units coming under the GMR Special Economic Zone and proposed Petroleum, Chemical and Petrochemicals Investment Region (PCPIR), Visakhapatnam. 2. 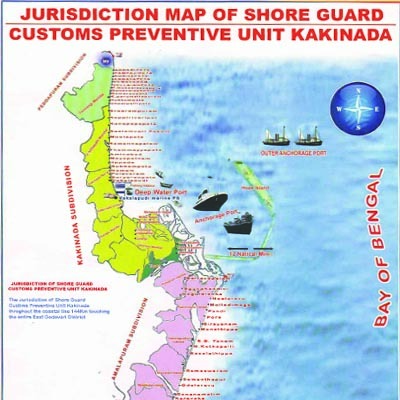 LNG Terminal : One Floating Liquid Natural Gas Terminal is proposed to set up at Kakinada. If itis a Joint Venture between AP government and GAIL, GDF SUEZ and Shell. 3. Dreding Harbour : The central government recently announced to establish a dredging harbor in Antarvedi waters. The centre has allocated Rs 1800 crore to build this Dredging Harbor with international standards. This site is best viewed with 1024 x 768 and above pixels resolution.